One of the challenges we often face as therapists is how to help clients find the balance between focusing on their emotions or difficult experiences and then being able to put those things away. In therapy we often encourage clients to be more aware of their feelings, honor those emotions, and spend time addressing difficult memories like trauma. However, we also need to give clients the tools to not be overwhelmed by those emotions and memories, be able to turn away from them so that they do not excessively dwell on them, and be able to mentally ground themselves in a sense of felt safety. Using the metaphor of a protective container – both through visualization and art-making – can be one way to help clients to practice this. In my own art therapy practice, the idea of protective containers has taken on a few different forms. One of the things that they all have in common is that they help clients to have a metaphor of separation from the upsetting feeling/thought and also an experiential way of engaging with the metaphor. 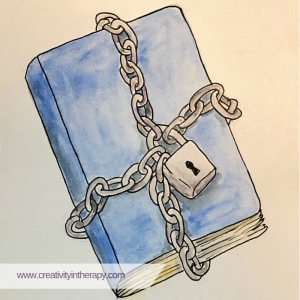 This is one of the powerful aspects of art in therapy – instead of just talking about an idea or metaphor, we can make it visible and tangible in the room, strengthening the client’s connection with it. Creating a “worry box” for children with anxiety. When anxious thoughts come up, they can write them down, then add it to the box as a way of letting go. 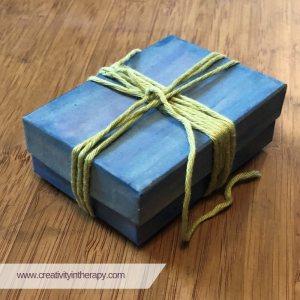 The box can be kept with the therapist in the office, held by supportive parents at home, or even given to a teacher to use when worries come up often at school. A safe container for the things the client is not yet ready to share with the therapist. Especially when working with children with trauma, I have had clients that acknowledged that there were important things that they were not yet ready to discuss in therapy. The container provided a means for the client to write down what these things were, bringing them more fully into the room, but keeping them private and safe until they felt ready to face them more directly. As a playful way to fight OCD or other problem “bullies.” Personifying and externalizing a problem like OCD can help children better fight back against it. Often we will discuss the metaphor of fighting and “locking up” the bully (problem) when it starts to bother the child. They can then draw this in their art or act it out with a box and other art supplies, helping them to both feel empowered and have a playful, engaging way to address the problem. Leaving behind nightmares and fears. Talking and drawing about nightmares and fears can often be challenging for kids but can help them to move past them. I will offer that we can seal up the scary drawing in an envelope before we put it in my filing cabinet. Some kids choose to add extra tape, drawings of locks, and written warnings on the outside of the envelope to strengthen the sense of containment. Keeping the client art in our office is often an important part of the safety and containment that we offer our clients and the extra step of sealing it up can enhance that sense of safety. To visualize putting away distressing emotions, thoughts, and memories. Although we may need to explore distressing things in therapy sessions, clients also need a means to put these things away when they leave. Similarly, clients may need a way to stop negative rumination or be able to ground themselves when experiencing intrusive thoughts. 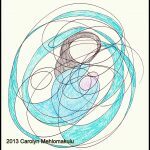 Clients can identify their own metaphor for protection or containment of distress, then create this symbol through the art. When distress arises later, clients can practice mental grounding and visualize putting the distress away in the safe container. 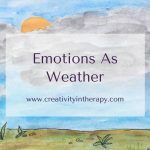 To try this with clients, first discuss the idea of being able to choose when we face certain emotions versus when we need to contain them. The goal is not to encourage clients to repress difficult things, just to be able to contain them when necessary. 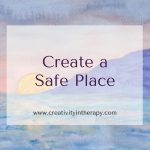 Lead the client through a relaxation exercise and end by asking them to imagine a barrier to protect them from distress or a container that could hold these thoughts and feelings. Prompt them to fill in details in their image, asking about size, material, locking mechanisms, etc. Direct the client to create an image or sculpture of their protective container, offering a variety of 2D and 3D art materials. Remember that you can adapt this idea of a protective container in whatever way is most helpful for your client, their situation, and the art materials you have available. I’d love to hear your thoughts in the comments below! Has this directive been helpful for your clients? 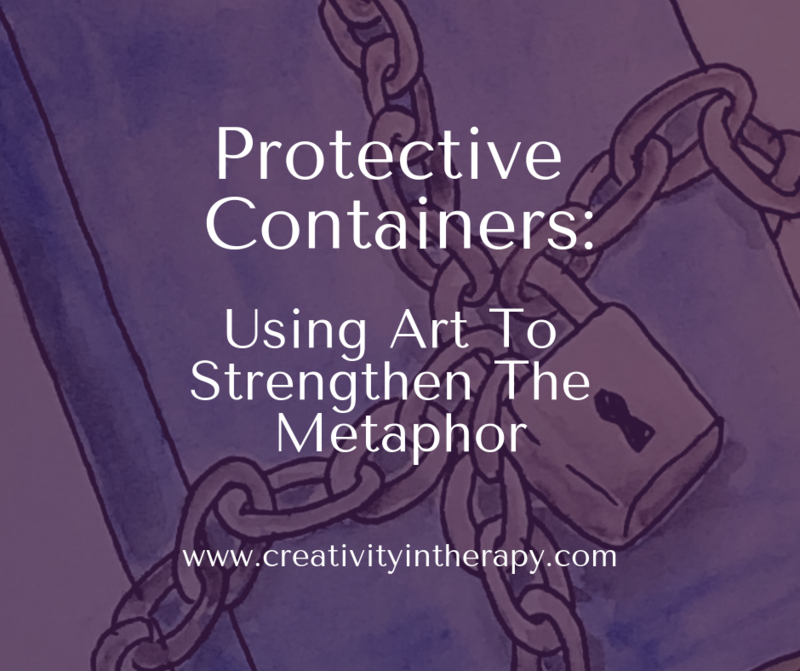 Do you have a different way to use the metaphor of a protective container? 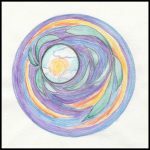 A version of this art directive is included in Managing Traumatic Stress Through Art: Drawing From The Center. Imagining a container for mental grounding is suggested in Seeking Safety: A Treatment Manual for PTSD and Substance Abuse. 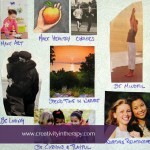 I will sometimes pair this art exercise with the chapter on grounding skills. 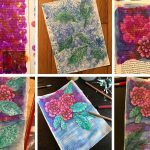 Thank you for sharing this process – how generous! Your explanation of the rationale was excellent and the guided meditation one of the best I have read. I will definitely be using it with a certain client of mine who needs just this tool at present. I have also used Worry Pots with my groups of 6-9 year old kids (in the form of a ‘clay lesson’ ) and had tremendously positive feedback, both from the kids and from some of their parents. I was actually surprised at how open the kids were talking about how many worries they had ranging from one to seven. Again, thank you for spreading your knowledge and for the easy-to-understand style you have of expressing these ideas. I am so grateful. Hi Marilyn – Thanks for reading the blog, and I’m glad to hear it was a helpful post. 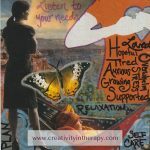 I had never heard of the Worry Pots idea, so thanks for sharing that! I did a quick online search to see an example.